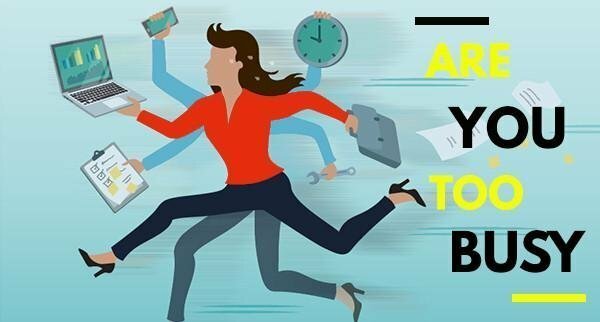 Are you too busy to work ON your business? » Blog » Are you too busy to work ON your business? Believe me, initially, every businesswoman had issues with finding the time to work ON her business. Having too many appointments, e-mails, social media and trying to give attention to the people you work with, often consumes most of your time. And very often the people that you would like to spend most of the time with, your family and friends, you don’t see them as much as you want. And that does not feel right. Just as it does not feel right that you don’t seem to go a lot faster ahead with your business because of your To-do list will only seem to get longer. And when I'm very honest about it, this sometimes happens to me too. It is too easy to give in to all the issues around you in the day-to-day routine and worries. And for businesswomen that is even more difficult than for men, because men can usually focus better. Not working towards the future of your business or making sure that your business is running smoothly so that things become easy does not feel good. Many businesswomen don’t choose to work towards the future and run their business as a system, because often they don’t know how to and that is why they keep on doing it the way they are used to. Two things play an important role in changing this. Your feeling and the daily reality And what time is meaningful and useful time for your business? It does not feel right if you do not work on your business. It does not feel right if you are always too busy. It does not feel right if you think you are not moving forward. Financially it was a great month. I had also spoken to many customers that I helped ahead. A coaching program with a nice and loyal customer was successfully completed. I also gave 3 workshops on all kinds of themes of entrepreneurship. I had many successful meetings in Switzerland where I found several sponsors for my business network group there. What then made me feel like it was going bad? Because of my idea, that I did not have enough time to do everything that I wanted to do. What a bad indicator is when it comes to how well your business is going. What time is meaningful time for your business? That is scheduling time to work on your business because this will also give you extra time. Every time I do a task, I ask myself, do I do this once or do I have to do this more often? If I have to do it more often, I spend extra time on it and make it into a process. I think can I outsource this the next time. If the answer is yes, I make a procedure for it. I make an action plan, I describe the various steps. I sometimes even record it with video on my laptop screen whilst I am actually doing the task. All of this I do, because the next time when this task comes up again, I can outsource it very easily. And then it saves me a lot of time. Had I not spent the time to make it into a task for someone else I probably would have done it myself again, because I know I can do it faster than anyone else. And if I do decide to not outsource it my task is easy because; I have a checklist, or templates ready for myself, making me go faster this time and now it will be a routine job. Just think for a moment how much time this can save you especially if you have a larger company? You only have bite-sized chunks and yet you can continue to deliver custom work to your customer. If they ask that from you or if you want to deliver custom work. For example, an offer to a new potential client is no longer something that you have to recreate and each time, but a list where you simply delete all options that are not taken. It really pays the time to work on your business. 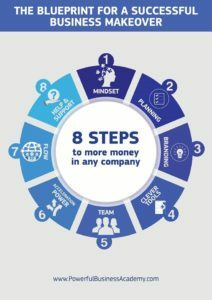 If you do this systematically and make a sport of it on how you can make it as simple as possible for you and the people you work with, you will see how much more you can do in a year and how much further your company will be. My customers Karin and Jaap also worked ON their business under my guidance and coaching. They have a lot of systems in their business now which makes work so much easier for them. And therefore they can scale up so much easier because they have more time, more KPI’s and more overview on well they are doing. Tineke Rensen is a businesswoman in every vein of her body. She has 29 years of business experience of her own. In 2012, she sold her first successful international business. She now dedicates her time to other businesswomen and helps them do the same. Scale up work more effortlessly and practice all the genuine business skills such as. Managing your team, make financial plans make marketing plans systemize the business and so on. She has developed her own business model which guarantees success for every business owner. "The Blueprint for a Business MakeOver" This zooms in on 8 areas of doing business. Tineke gives entrepreneurs a shorter route to success. Why should you first invent everything yourself? Her book, "Maximum Business Growth for Women" came out in October 2016. Tineke has conducted a study on how women do business. If you are interested in the results, please have a look here for more information and than you can download the whole report. If you want to know how you can make a big leap forward with your business, request a free Next-Level conversation with Tineke.